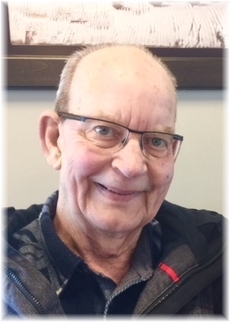 Donald James Beatty, age 74, passed away at Dauphin General Hospital on July 24'th, 2018 after a short battle with cancer. He was born in Winnipeg on March 1st, 1944 to James and Ethylin (nee Gronback) Beatty. He grew up on the family farm on the west side of Ditch Lake (north of Erickson), attending Tales School for Grades 1 - 9, and Erickson Collegiate for his high school. He started working for his brother at Ken Beatty Construction about 1970, and continued there until retirement. During that time, on one of his many Dauphin Bingo trips, he met Tillie (Tina) Copeland (nee Chuipka) and later they married on May 21st, 1994 becoming the instant father of 4 and grandfather of 7 who all loved and adored him. He was well known for his easy going manner and being able to hum his way through life's ups and downs, never getting upset or raising his voice. He had an uncanny ability to remember people; their names, spouses, siblings,and important dates and events. He is survived by his wife, Tillie residing at Dauphin Personal Care Home, brother Venton Beatty (Marlenne), sister-in-law Carol Beatty (pre deceased by brother Ken). He leaves behind children Marion Janzen (Henry), Cindy Sylvester (Brett), Sharon Trevena (Gerald), and Fred Copeland (Kyla). He will be missed by 11 grandchildren as well as 19 great-grandchildren. His Beatty nieces and nephews (Shaun, Garett, Lynell, Kristopher, Maurice and Ryan) will also miss their Uncle Don. Kevin Beatty passed several years ago and will be welcoming his Uncle in heaven. Memorial Service was held on Friday, August 10, 2018 at 2:00 pm from Sneath-Strilchuk Family Care Centre in Dauphin, MB with Mr. Elgin Hall officiating. Interment followed in Riverside Cemetery in Dauphin, MB. If friends so desire, donations in memory of Donald may be made to the Dauphin Personal Care Home or a charity of one's choice.